The four major power projects on Satluj have been temporarily shut due to heavy discharge of silt in Satluj river following flash floods due to heavy rains. CHANDIGARH: Blackouts were reported in various parts of Himachal Pradesh and power supply to the northern states has been disrupted. Four hydro projects in the hill state including the country's two mega hydro projects 1,500 MW Nathpa Jhakri plant and 412 MW Rampur Hydro Electric Project besides 300 MW Baspa Stage-II and 120 MW Bhabha have been temporarily shut down due to rise in slit levels in the Satluj river. These four major power projects on Satluj have been temporarily shut due to heavy discharge of silt in Satluj river following flash floods due to heavy rains. The silt level in Satluj rose to 60,000 particles per minute from 30,000 particles from midnight as there were a flash flood in the upper region between Nathpa and Baspa valley due to heavy rains in last forty eight hours thus these hydro projects have to be shut to prevent them from damage, said sources. Sources said the Bhabha and Baspa hydropower projects were shut down due to high-silt level in the Baspa and Bhawa rivers which are tributaries of Satluj. This in turn has resulted in blackout in parts of the state. As Himachal Pradesh needs about 1300 MW to 1500 MW power every day. It is facing an acute power shortage of 1000 MW from last evening, said sources. It is pointed out that the power to the industry has been totally cut off due to this shortage. The state government has arranged 600 MW of power from different sources to meet the demand of domestic consumers but the power to industry is still a problem as there is 400 MW shortage. Sources said that the 1000 MW Karcham Wangtu project was still running. As due to rains flash flood came in the belt between Nathpa and Baspa, not in the area above Karcham. Since morning the silt level has come down 10, 000 ppm and power situation is expected to be normal soon thus power projects will resume production. The Nathpa Jhakri hydropower project is in Kinnaur district, while the Rampur Hydro Electric Project is located in Shimla district. Satluj Jal Vidyut Nigam Limited a joint venture between the central and the state governments runs both these power projects and supplies electricity mainly to Punjab, Haryana, Chandigarh, Delhi, Rajasthan, Uttar Pradesh, Himachal Pradesh, Jammu and Kashmir and Uand. Due to heavy rains most roads in Himachal Pradesh remained closed thus commuters were strandered. The worst affected were Sirmaur and Kullu districts. The Mandi-Pathankot National Highway 20, which was closed for vehicles near Kotropi village in Jogindernagar was reopened partially but traffic beyond Ribba in Kinnaur district remained suspended since a large stretch of the Hindustan-Tibet Road was under debris owing to landslides. The road nin the higher reaches of Kinnaur, Shimla, Chamba, Mandi and Kullu districts was worst affected. It is learnt that three people, including a woman were washed away near Kinner Kailash in Kinnaur. As around 60 devotees returning after paying obeisance at Kinner Kailash and were struck on the way. These three people were washed away as they were crossing a nullah. 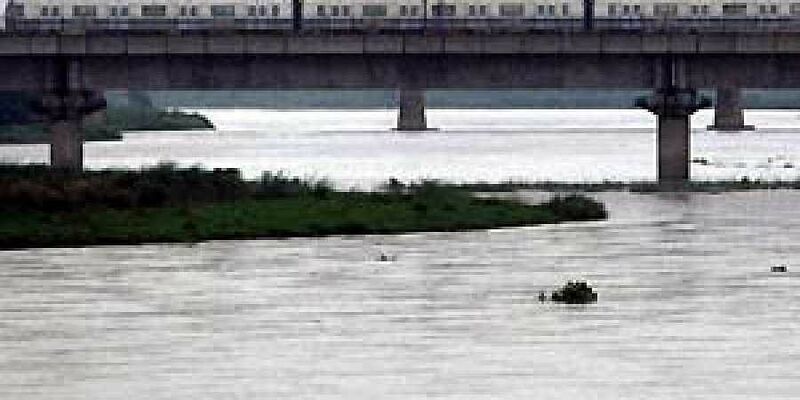 Excess water has been released from Hathnikund barrage in Haryana into the Yamuna river, posing a flood threat to New Delhi. Over 200,000 cusecs of water was released into the Yamuna from the Hathnikund barrage which provides drinking water to New Delhi. The water level at the barrage along the Haryana-Uttarakhand border rose to high levels due to heavy rains in Himachal Pradesh and Uttarakhand. The water level in the Yamuna crossed the danger level. The villages along the Yamuna had been alerted about the release of the excess water. The Yamuna river passes through Yamunanagar, Karnal and Panipat districts in Haryana before entering New Delhi.